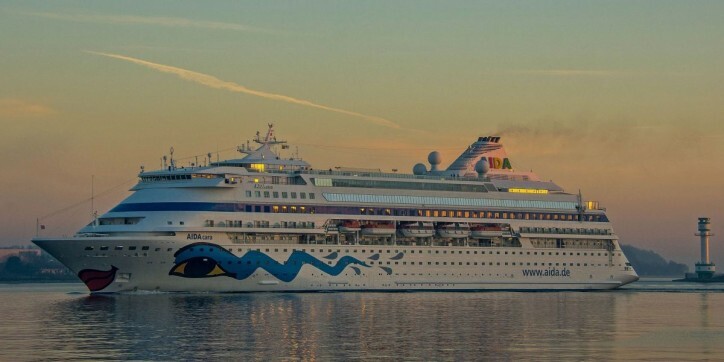 The call by the cruise vessel AIDAcara on Sunday, 7th April, marks the beginning of Kiel’s cruise season 2019. The port is currently investing about 30 million Euros in the cruise sector. Half of this amount is dedicated to sustainability measures. To that effect, the construction of the commercial port’s first onshore power supply plant at the Norwegenkai Terminal is on the finishing straight. The facility will be inaugurated this spring. The Ostseekai Cruise Terminal and the Schwedenkai Ferry Terminal will both be equipped with onshore power supply plants as well next year. This innovative project has been tendered just recently. Kiel expects numerous highlights this season and a new record in terms of tonnage. After the new vessel Mein Schiff 2 has already been handed over by the Meyer Turku Shipyard to the shipping company of TUI Cruises at the Ostseekai at the beginning of the year, another six maiden calls are envisaged for the season. The vessels Nieuw Statendam of Holland America Line, the AIDAprima as well as the expedition ship World Explorer will visit Kiel for the very first time amongst others. The most frequent guests will be the vessels of the shipping companies of AIDA, TUI Cruises, MSC and Costa that use Kiel for passenger turnaround. The largest vessel of the season is the MSC Meraviglia (171,600 GT) which sets a new record in terms of tonnage on the fjord. With this ship, MSC is offering 22 voyages across Northern Europe starting from Ostuferhafen. The peak of the season will be on 17th August when in addition to the large ferries to Scandinavia there will be no less than four ocean-going cruise vessels in port at the same time, namely the AIDAprima, the AIDAluna, the Vasco da Gama and the MSC Meraviglia. A total of 179 visits (2018: 169) by 33 different cruise vessels have been registered in Kiel for 2019. The overall tonnage rises to more than 15 million GT (2018: 11.5 million GT) and the number of passengers is expected to clearly exceed 600,000. In order to continue to offer the first-class service to the ever-growing number of passengers also in the future, a second modern terminal building is currently under construction at the Ostseekai, which abuts the northern side of the existing terminal building. The works have begun with the ceremonial laying of the foundation stone at the end of October 2018 and will continue on until summer 2019. The check-in service at Berth 28 will take place using a tent system which is currently being assembled. As the construction works at the new building progresses, the gangway will connect the northern berth to the existing terminal again. The new terminal will then be taken into operation during the middle of the season. The winter months were also leveraged to extend the scour protection and to establish a consistent water depth at the Ostseekai berths. Furthermore, the sheet piling wall of Berth 28 will receive a coating in the area of fluctuating water levels, a concrete beam will be inserted and the fenders will be revised. At Ostuferhafen, the port apron is being expanded in the meantime and Shed 7 will be integrated into the passenger handling processes for MSC Meraviglia as of 27th April. The sea tourism sector continuously increases its economic importance for the State Capital City of Schleswig-Holstein. More than 2.2 million passengers are expected to board or leave a ferry or cruise vessel in the port of Kiel this year. According to the recently published study, passengers already generated a turnover of about 68 million Euros in Kiel in 2017. The total consumer spending of the ferry passengers of the port of Kiel amounts to more than 53 million Euros. Another 15 million Euros are added to that by cruise passengers’ and crews’ expenditure. More than 100,000 overnight stays in local hotels are booked by passengers for the time right before or after their cruise. The average consumer spending of one passenger beginning his or her cruise in Kiel amounts to about 48 Euros. About half of the daytime visitors arriving in Kiel by cruise ship go on organised shore excursions, another 40 % make individual excursions. In addition to the excursion costs, every stop-over passenger spends 20 Euros on average in the region. Last year, an emission measurement study was conducted in the port of Kiel of which the results are now available. Regarding the airborne particles PM 10, the municipal background pollution measured at the reference station “Bremerskamp” amounted to 15 µg/m³ (annual limit value: 40µg/m³). The pollution values at both monitoring points of the port did not differ from the municipal background. The permitted regulatory thresholds were not exceeded on any day. The results for PM 2.5 are similar. The average annual value measured was 8.1 µg/m³ (limit value: 25 µg/m³) which is also in the range of the background pollution level. Similarly, the nitrogen dioxide pollution at the points of measurement safely remains well below the threshold value (40 µg/m³). On “Hegewischstraße” an average NO2 level of 21.3 µg/m³ was measured which is to be classed as being one of the higher values of the municipal background pollution. Around the University of Applied Sciences the pollution measured lay at 15.8 µg/m³ which is of a similar dimension to that taken at the reference point of measurement at “Bremerskamp” (14 µg/m³).